It’s been said over and over again that breakfast is the most important meal of the day, and I’ll just echo that here. A good breakfast sets your entire day up, so don’t ignore this meal. Instead, make it special every day. See below for some great ways to start your day off right! Oatmeal – Let’s face it, oatmeal isn’t that exciting all by itself. Unless you take into account the amazing health benefits, it’s hard to get pumped about it. But it doesn’t take much to jazz it up a bit and make it a solid breakfast performer. Here’s a couple things I do. First of all, stay away from the sugary instant variety. The added sugar in these is a great way to ADD to your inflammation, not reduce it. Instead, opt for the steel cut variety – they’re much healthier for you. TIP: I prepare enough for the entire week, and I do it on the weekend. It’ll keep all week in the fridge and it saves time in the morning. Turn the heat down to a simmer and cook for 20-30 minutes, stirring occasionally so it doesn’t stick or burn. And here’s where we go from boring to brilliant! Mix in some dried cherries, or even better, fresh ones, for a great taste and an extra boost of antioxidants that are well known inflammation fighters. In fact, any dark colored berry that’s a favorite of yours can be added to your oatmeal to spruce it up. I also chop up a banana and throw in some raisins to make things taste better. 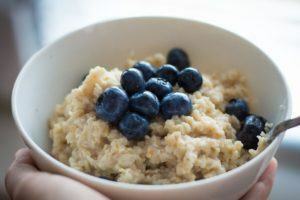 When we think of oatmeal we naturally expect something sweet landing on our taste buds, but oatmeal works surprisingly well with savory foods as well. Try adding sautéed spinach and lean Canadian bacon for a real taste treat. A small handful of nuts also works well, and almonds or walnuts are known to reduce inflammation. Oatmeal by itself doesn’t do it for me, but dressing it up makes it into a super way to start the day. There are endless ways to jazz up your oatmeal, so use your imagination. Give it a try, and stay away from the instant stuff, you’ll be better off for it. Previous Post Mighty Oatmeal Next Post Welcome!